Matthias looked Wildermieminglike he haven´t had enough sleep when the alarm woke us up. He could feel that the last evening and the night was to long and he had one beer to much. So he needed some time to get on his feet and we where happy that we´ve booked the night with breakfast included. The breakfast at the Tillfussalm was perfect to recharge our energy. We had fresh bread, buns, an egg, marmalade, sausage and cheese. And the most important thing this moring: Fresh coffee. After the tasty and filling breakfast we packed our backpacks and slipped into our hiking shoes. For the first time we could feed that we´re on the trek for three days now but we felt good enough to walk further. We payed our bill and said goodbye to the owner and stepped into the morning fog without seeing the hikers from last night again. In front of the Tillfussalmwe had to cross a cow pasture and a mountain creek before the trail leeded us up to our first climb for today. The first destination was the Nieder Munde and we could see it when we started at the lodge. We ran into cold fog and it wouldn´t leave. The morning was very cold for a summer day. As we walked uphill we could feel that the walk brought the energy back in our bones and after two hours we stood at the Nieder Munde at 2.059 m and had an amazing view down in the valley on the other side. The weather hadn´t changed much but we where happy that we could walk without rain. After the Nieder Munde we had to walk down into the valley. 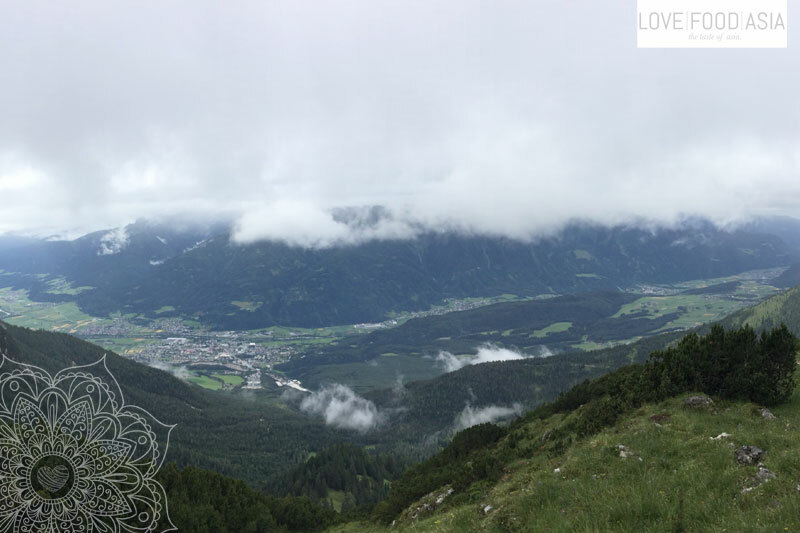 After a while the trail trended alongside the hill through a conifer forest until we reached the Neue Alphütte. The Neue Alphütte is a popular destination for hikers and mountainbikers because it is placed in a short distance from Wildermieming. This lodge is also a perfect destination for families and has a very good cuisine. We arrived during lunchtime and so we decided to have a warming soup with Kaspressknödel. Both of us ordered a ski water to save some money. We ate the soup on a small table with our backs at the warm oven and we got really tired. But we forced us to walk further to our today´s destination. The Finkhof in Wildermieming. We stepped out oft he lodge into a light rain. The trail passed through another forest and the rain stopped soon. We where walking lightly downhill to Wildermieming and the weather was changing quickly. When we stepped out of the forest the sun was shining brightly. We could see the small village Wildermieming right in front of us. After we´ve crossed some green meadows we entered the village to search our small guesthouse. The Finkhof is placed on the border of Wildermieming and from our balcony we could see the mountains in the south. Tomorrow we had to cross those mountains. The owners where very friendly and helpful. We highly can recommend this place for a longer stay with your family. On the opposite side of the street is a restaurant called Landhotel Jäger. We had a delicious meal for a fair price. After dinner we sat on our balcony and enjoyed the sublime sunset before we felt into our beds.